1) Wait. It took me 3 years to get the right day for this photo. The leaves on the Cherry trees are only the right color for a few days and the weather has to cooperate. 2) Make the photo with the highest resolution camera you have… I used a Canon 5D (15 megabyte Raw file) but I would have rather used a 4×5 view camera. I was just afraid to drive home (5 minutes) and get it and come back to a scene that wouldn’t be right. 3) Bracket some exposure to get both the shadows and the bright clouds under control. 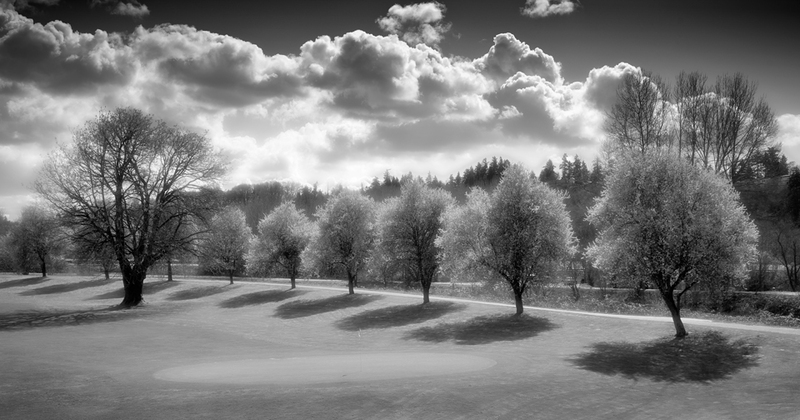 4) Bring in high and low level exposures to Photoshop and align them, convert to black and white using a method which leaves the maximum file contents (do not just convert to gray scale), paint with layer masks to reveal or hide what you want, apply a glow to the tree tops, flatten, split into layers, sharpen one and use transparency on the other to make the sharpening perfect. 5) Save at each step so you can go back if you goof or change your mind. The order you do these things in is important and my order may not work for the next photo so you need to be flexible. And you need a computer that will handle 200 megabyte files without breaking into a sweat. This entry was posted on November 7, 2008 at 4:54 PM	and is filed under Landscape Photography. Tagged: Landscape Photography. You can follow any responses to this entry through the RSS 2.0 feed. You can leave a response, or trackback from your own site. Beautiful image! What’s your preferred b&w conversion method? Can you please explain more about transparency on the 2nd layer? On conversion to BW. It’s anything but “convert to grayscale”. When you do that you throw away almost all of the content of the file. I use two different methods depending upon how it looks… One is in Lightroom or Camera RAW where you go into the area called HSL, Color, Grayscale. When you do the conversion here you have available all the color information to use the sliders…. The sliders act just like colored filters would in front of the lens if you were using BW film like Tri-X or Ilford Delta. The image has to be RAW or the results are less than they could be. PSD and Tiff are OK but Jpeg’s are pretty much junk. The other method is an action I got for free someplace that is meant to convert to sepia via a route of going into LAB color space to blend channels for color/contrast control, then to duotone mode to create the color cast for the sepia colors, then back to RGB for use. You can arrest the action when partial completed (history palette) to get the results you want. Transparency of a layer is controlled by using the Opacity slider in the layer palette. You have to have more layers than just the “background” to do this. A lot of this has to do with thinking 3D instead of just 2D. Let me add one thing on color conversion to BW… In photoshop 9 and 10 (maybe earlier too) there is a pull down menu called Image > Adjustments > Black and White. This is the way to go for photoshop based change for psd, tiff and jpeg files. If you want great skin use the green filter setting. There is another way to go and that is Image > Mode > Grayscale. Going this way is a disaster for image quality.